I have been an ardent admirer of the work of Marcella Hazan for as long as I can remember. I think I have just about all her books. ‘The Classic Italian Cook Book’ is as close to a cooking bible there is for me. Stained and dog eared, my copy has been with me since the early days of married life, when diving into culinary passion found fertile ground and plenty of appreciative palates. During the years of my vegetarian explorations, I didn’t consult Marcella as often as those early years. Now back to inclusion of a full range of local and seasonal food, I find I have been pulling this bible down off the shelf more often. The package of frozen grass fed ground beef from the farm down the road has been burning a hole in my freezer. I finally brought it out to defrost in the fridge the other day while debating whether to make meatballs or Bolognese meat sauce (ragu)**, happening without any actual memory of the last time I made either one. It would be a momentous event for sure after all these years! I woke this morning, assessed the larder, and finally decided Bolognese to be the winner. Marcella’s recipe calls for milk and white wine, neither of which I have. I dilute (just a bit) some heavy cream with water and fashion some wine by mixing rose water with a little dry sherry (surprisingly white wine like!). Finely chop half a medium onion, a medium carrot, the last few mushrooms in the fridge (not part of the recipe, but they needed to be used up, chopped fine, a great addition, smile), and a stalk of celery. With everything ready, I begin to cook (as per recipe below). With Marcella it is always a very particular process. Sometimes there are explanations why, sometimes not. I just trust. My favorite instruction in this recipe is to cook the sauce at ‘the laziest simmer’. It is one of the instructions that doesn’t offer why. You just have to know that cooking something slowly over a longer period of time offers the potential yield of something more integrated, richer and more delectable to a discerning palate. Experimenting with all the burners and the lowest possible heat still produces more than the occasional bubble however. How can I really slow it all down? How can I move even more slowly than this day? Meanwhile, the aroma filling the house is tantalizing and complete. How in the world am I going to be able to wait five hours to eat this meal? 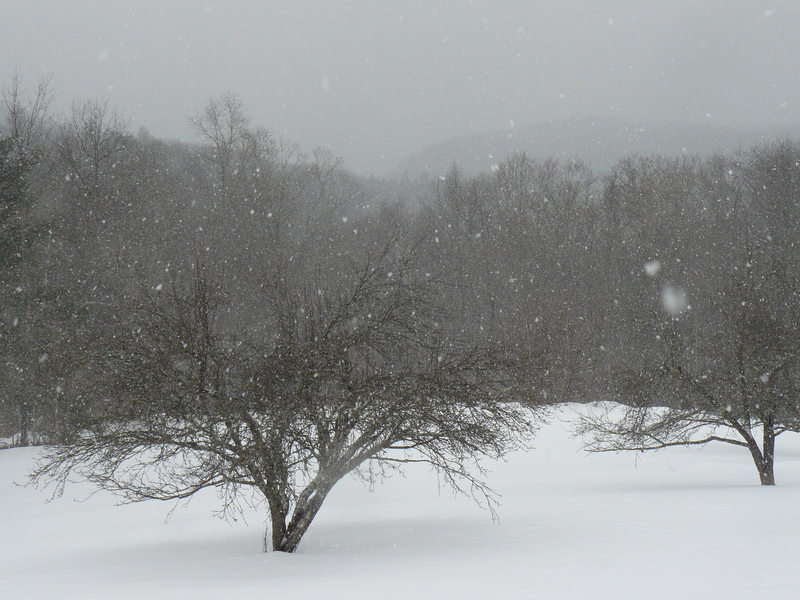 It is a blustery day and the snow has started flying again. Movement is furious in all directions. 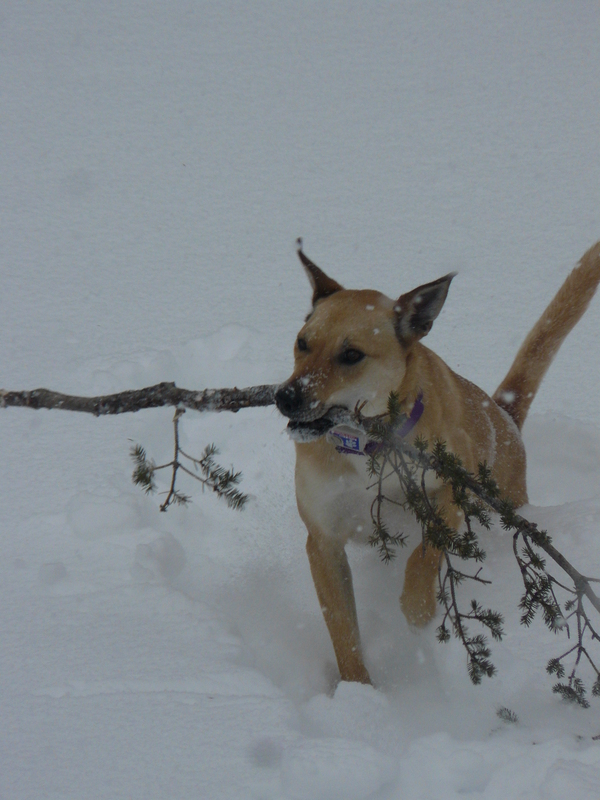 Like Nora, I need to expend some energy and find chores to do around the edges of the house outside, clear some paths, assess the extent of ice damming and knock down sections of frozen overhang, shoveling the few inches accumulating in the driveway, while intermittently throwing a sizable branch out into the abyss of the snow covered meadow for Nora to retrieve. Standing on the crest of the snow plow created hills now fringing the driveway I feel the winter stillness within the fury. It feels good to be standing there within this slowed down place inside. Warm. A warmth that clearly developed deep inside while moving slowly to the easy rhythm of self-initiated movement. The fire in the woodstove has burned down to just an ember by the time I return. The sauce is now clearly cooking at its laziest simmer after having cooked down quite a bit. 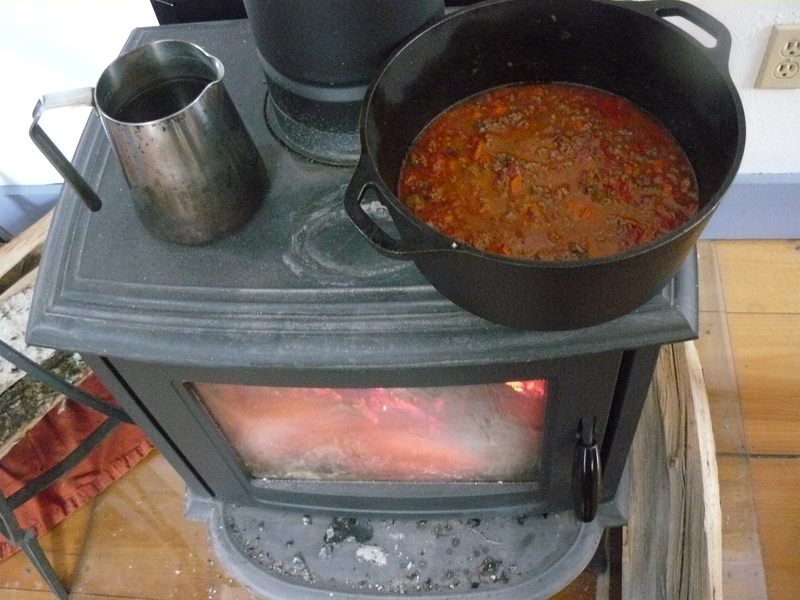 I put another log on the fire and it doesn’t take long for heat to begin steaming out of the pot again. It is an exquisite sauce, even if not cooked for 5 hours in the most gentle way. Being able to sustain that perfectly balanced place of laziest simmer is clearly something that I will continue to work on…. 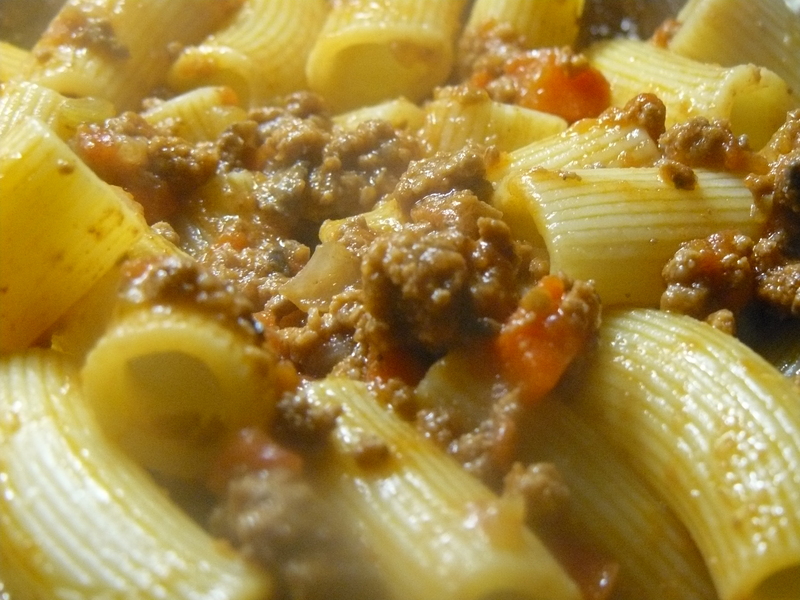 *adapted from recipe for ragu found on pp. 127 of The Classic Italian Cook Book by Marcella Hazan, copyright 1973. In a deep pot (preferably enameled cast iron) saute onion in butter and olive oil briefly over medium heat until just translucent. Add the celery and carrot and cook gently for 2 minutes. 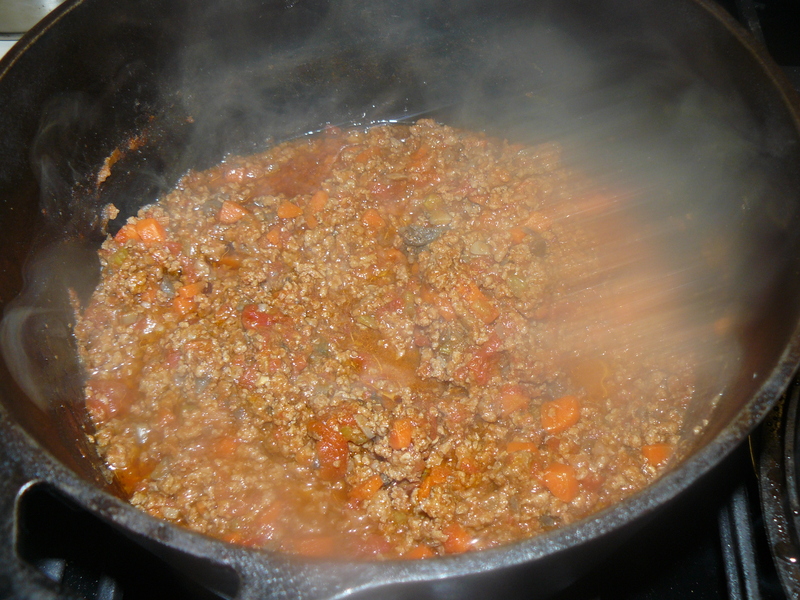 Add ground beef, crumbling it in the pot with a fork. Add 1 teaspoon salt, stir, and cook only until the meat has lost it’s raw red color (it must not brown or it will lose its delicacy). Add the wine, turn heat to medium high, and cook, stirring occasionally, until all the wine has evaporated. Turn heat down to medium, add the milk and the nutmeg, and cook until the milk has evaporated, stirring frequently. (Meat must be cooked in milk before adding tomatoes, this keeps the meat creamier and sweeter tasting). When milk has evaporated, add the tomatoes and stir thoroughly. When the tomatoes start to bubble, turn the heat down until the sauce cooks at the laziest simmer, just an occasional bubble. Cook, uncovered, for a minimum of 3-1/2 to 4 hours (5 is better), stirring occasionally. Taste and correct for salt. (If you cannot watch the sauce for such a long stretch, you can turn off the heat and resume cooking it later on, but do finish cooking it in one day). Note: ragu can be kept in the refrigerator for up to 5 days, or frozen. Reheat until it simmers for about 15 minutes before using. My mouth is watering and I’m heading outside with my shovel! This is all your fault, smile.